This planner supply case doubles as a holder of pens, pencils, and supplies as well as a band for keeping your planner closed. 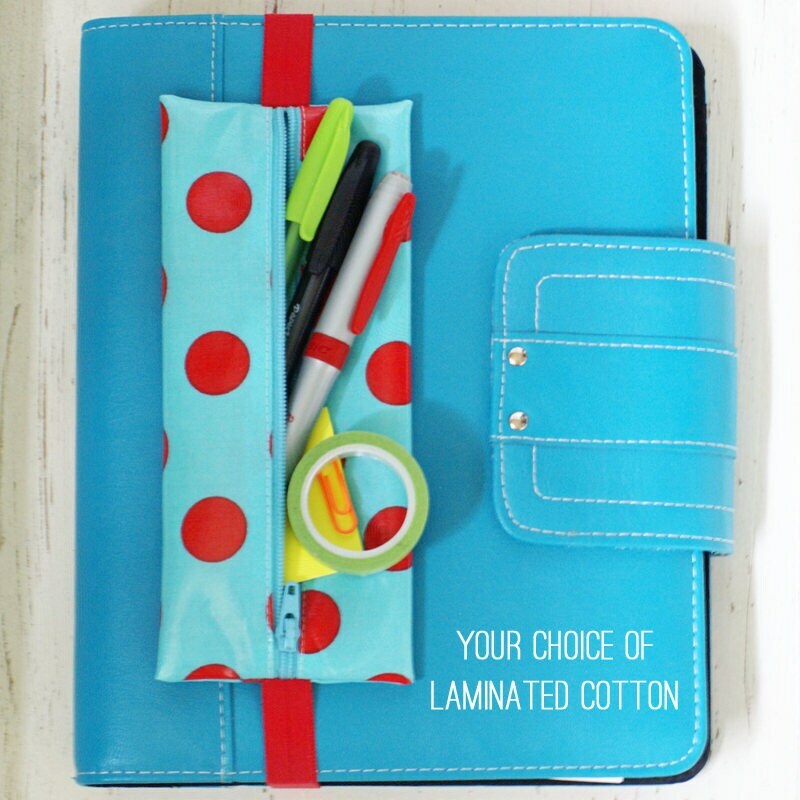 It can also be used as a Bible pouch for holding writing instruments for Bible journaling or note-taking. Into the coloring book craze? 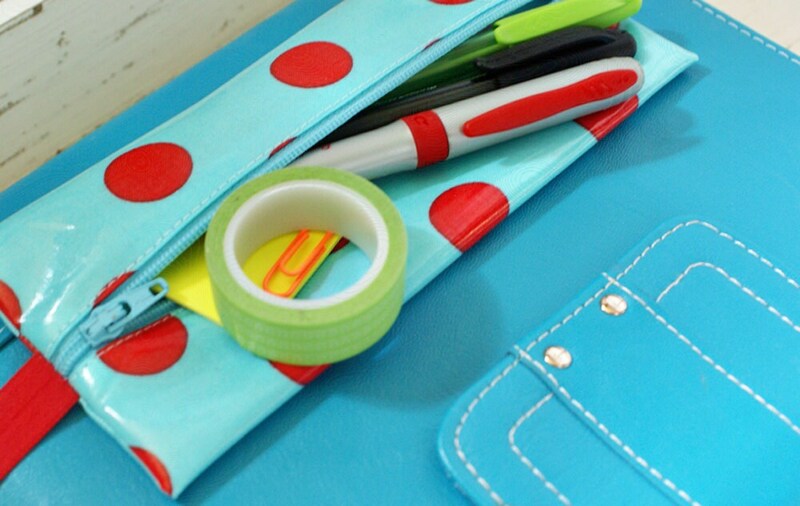 It's a great way to keep your colored pencils or markers close at hand. The pouch is very flexible and low-profile, which keeps it from being bulky when you put supplies inside. If you're looking for a firm and thick interfaced pouch, it may not suit you. Made of durable laminated cotton, the pouch is easy to keep clean by wiping the exterior with a damp cloth. This makes it perfect for kids as well, especially since the laminated cotton we use is free of BPA, PVC, and phthalates. 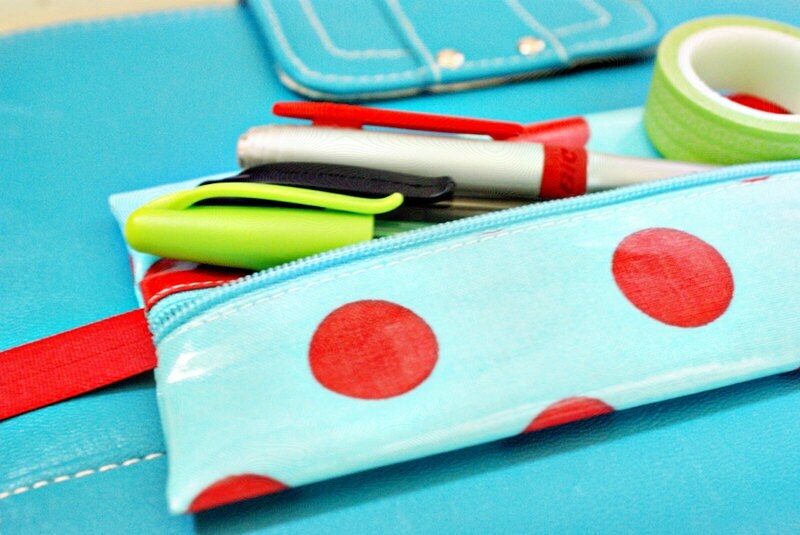 This zippered pouch measures 7" x 3" and the elastic length depends on the total circumference. • Decide whether the band will go around the entire planner/Bible/notebook/etc. or just the front cover. • Measure the circumference of the area where the band will attach, all the way around, in inches. If you don't have a fabric measuring tape, wrap a piece of string around it, make a mark, and then measure the length from the end of the string to the mark. • Specify your fabric choice AND circumference in the note at checkout. If you don't have your planner with you, there is an option to contact me later with the measurement. Please be careful to follow these steps, as stated processing time begins once I have all the information that's needed. Not receiving it at the time the order is placed will likely cause a delay. If you need a pouch that's shorter than 7", please inquire about cusotmization. Genius - keeps my unorganized self much more organized...never looking for a pen, pencil or dry erase marker. It's perfect! I love it so much. I appreciate the communication. You were a pleasure to work with! Made well, wish I would have requested a tad smaller but works beautifully.